The structure of a building is integral to its success: choosing the right material and method of construction can affect everything from the finished project’s BREEAM rating to the return on investment. Getting it right from the beginning is crucial. With potential legislation changes pending, working with a partner you can trust is just as important than the final choice of the structural frame solution. An experienced structural specialist is ideally placed to work alongside architects, main contractors and even the end client to deliver a successful scheme that meets regulations and exceeds expectations for all involved. At B&K Structures, we have a long history of innovation to ensure that our projects will stand the rigours of time, conform to legislation, offer environmental benefits as and meet the design challenges. Our commitment to innovation means we think beyond the structural frame, moving forward towards more frame and envelope solutions which will include full system testing from the outset ensure that our products interact with all elements of the building. Different projects call for different solutions, and we work closely with designers and our supply chain partners to deliver the correct result. We always look for ways we can add value to projects – whether it’s reducing the load on the foundations whilst gaining additional storey heights, or maximising floor space to create airy interiors. Certain materials lend themselves to applications more than others. For projects where sustainability and reducing environmental impact is a key target, engineered timber is the best option, and we remain fully behind our cross laminated timber (CLT) and glulam offering. Our timber products are fully PEFC or FSC certified, and the carbon is locked into the building rather than released to the atmosphere. 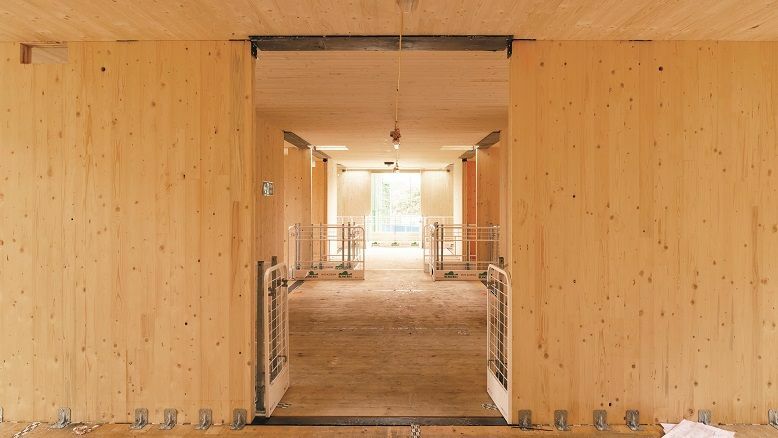 Timber is the only truly renewable construction material, and when combined with offsite construction methods, CLT’s impact on a project’s sustainability is impressive – especially where there are carbon reduction targets in place. Using CLT as a structural material will lower the overall mass of the building, having a positive impact on foundation and piling design, reduces construction programmes and allow follow on trades to the start much sooner in the process then traditional build solutions. CLT also brings forward fewer site personnel, fewer deliveries, all helping to have a positive impact on the local community during the construction phase. Reduced costs, reduced time on-site, and increased return on investment makes CLT a future heavyweight in residential construction. Glulam is a structural element that is used in both vertical columns and in roofing trusses and supports. In terms of performance, it is comparable to light gauge steel frames and reinforced concrete structures whilst being, respectively, more sustainable and considerably lighter. Where space and floor areas are a priority, we encourage our clients to consider steel. We have over 35 years’ experience in structural steel, so for projects which require open, airy spaces with uninterrupted square footage on the ground, we know that steel is often the best solution. Steel structures use slim columns and large unsupported spans and are ideal for new build projects and refurbishments. What’s more, our offsite construction methods allow us to accommodate changes to the design during construction, and its lightweight nature means it can be installed quickly. When we couple a steel frame with CLT floor decks on commercial builds, we begin to see a very compelling argument. At B&K Structures our extensive use of BIM modelling cuts down on waste during the manufacturing of the glulam element, and our offsite construction methods with factory-controlled conditions allow us to create the glulam structural elements with minimal on-site contact. And with the option to combine CLT or glulam with steel elements as part of a hybrid structure, we can help to control costs, create innovative solutions and improve the environmental impact and aesthetic of buildings in equal measure. Whatever the project, we can work with our partners to devise a long-lasting structural solution that not only ticks all the boxes but safeguards the development for the future.